Posted in General on February 18th, 2019. Posted in General on June 25th, 2010. Following the publication of Garrett McLean’s GENE VINCENT Gloire Et Tribulations D’Un Rocker En France… a number of changes have been made in the 1962, 1963, 1964, 1967, 1969 & 1970 European Tour Dates sections regarding Gene Vincent’s gigs on the Continent. Posted in General on January 12th, 2006. 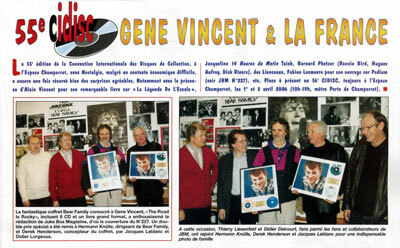 On 8 January 2006 at cidisc in Paris, Jacques Leblanc, proprietor of Jukebox magazine (left), presented the awards for Best Reissue of 2005 for the “GENE VINCENT The Road Is Rocky” Box Set to Hermann Knülle (centre) of Bear Family Records and Derek Henderson (right). 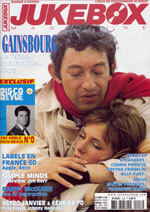 Le fantastique coffret Bear Family consacré à Gene Vincent “The Road Is Rocky”, incluant 8 CD et un livre grand format,a enthousiasmé la rédaction de Juke Box Magazine, d’où la couverture du No227. Un double prix spécial a été remis à Hermann Knülle, dirigeant de Bear Family, et Derek Henderson, concepteur du coffret, par Jacques Leblanc et Didier Lorgeoux. A cette occasion, Thierry Liesenfeld et Didier Delcourt, fans parmi les fans et collaborateurs de JBM, ont rejoint Hermann Knülle, Derek Henderson et Jacques Leblanc pour une indispensable photo de famille. “The Road Is Rocky”, the fantastic Bear Family box set devoted to Gene Vincent, including 8 CDs and a large format book, filled the editorial staff of Juke Box magazine with enthusiasm, hence the cover of No. 227. A special double prize has been awarded to Hermann Knülle, director of Bear Family, and Derek Henderson, producer of the box, by Jacques Leblanc and Didier Lorgeoux. On this occasion, Thierry Liesenfeld and Didier Delcourt, fans among fans and contributors of Jukebox magazine, joined Hermann Knülle, Derek Henderson and Jacques Leblanc for an indispensable family photo. Posted in General on March 27th, 2005. Thank you for your Discography of Gene. I find it most complete and containing information that I had no knowledge of. I do not recall ever overdubbing any of Gene’s records however it is possible that I did. It might be possible that the overdubbing was done in England. I’m enclosing my log of the sessions, dates, master numbers, T is the album number and R is the release number. I hope the info is of some use to you. I think this is complete but I can’t guarantee it. Thanks again for your great book.